For its third Special Exhibition, starting on 1 April, the Heath Robinson Museum in Pinner, north-west London, is delighted to showcase the illustrations of the highly skilled draughtsman and illustrator Edward Ardizzone. Edward Ardizzone (1900-1979) was one of the best loved and most prolific book artists of the 20th century, illustrating well over 170 books for adults and children. His career overlapped with that of Heath Robinson and they had many qualities in common. Like Heath Robinson, Ardizzone’s illustrations are generally concerned with contemporary life untouched by political, religious or ideological conflicts. This new exhibition at the Heath Robinson Museum, featuring many of Ardizzone’s greatest illustrations, will be divided into two sections. 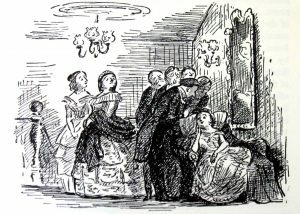 The first focuses on his work for adults, including 25 of his illustrations for Trollope’s first two Barchester novels, which have never been exhibited before. There will also be illustrations for Dickens, Hardy and Thackeray. The second section of the exhibition will showcase Ardizzone’s illustrations for children, including the preliminary sketch book for the ever-popular Little Tim – the Hero of the Storm and the title-page design for Stig of the Dump. We will also have illustrations for The Suburban Child, Graham Greene’s The Little Fire Engine and Robert Graves’s Ann at Highwood Hall.